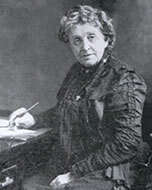 Josephine Cochrane believed that if you want something done right you better do it yourself. But when it came time to doing the dishes, she really didn’t want to, so she invented a machine to wash them for her. Cochrane’s early childhood is not known. After her mother died and her sister moved out, she lived with her father, John Garis, in Ohio and Indiana. He worked as a supervisor in mills and as a hydraulic engineer, perhaps instilling in Cochrane an instinctive knack for the mechanical. She attended a private high school, but when it burned down, Garis sent his daughter off to live with her sister in Shelbyville, Illinois. After high school graduation, Cochrane’s life took a traditional turn. At age 19 she married 27 year old William Cochran. In 1857, after a disappointing four years trying to strike it rich in the California Gold Rush, he returned home to Shelbyville and made his mark and fortune in the dry goods business along with other investment opportunities. No doubt the comfortable life he could offer his bride was one thing she was attracted to. In spite of her young age and the societal norm at the time, Cochrane was guided by her independent nature and personal confidence. She assumed her husband’s name but preferred spelling it with an “e” on the end, a point of contention with his family. The Cochrans had a busy social life, and in 1870 when they moved into what could be considered a mansion, they had the perfect house for entertaining. They threw dinner parties using heirloom china allegedly dating from the 1600s. After one event, the servants did the washing up and carelessly chipped some of the dishes. Cochrane discovered this the next morning while she was putting the dishes away. She was furious and refused to let the servants handled the china any more. One such morning while she was up to her elbows in soap suds, she had an epiphany. Why not invent a dish washing machine herself? Consumed with the idea, she immediately went into the library to think it through, forgetting she was holding a cup in her hand. Within half an hour Cochrane had the basic concept for the first mechanical dishwasher. Just like she had been doing by hand, it held the dishes securely (in a rack) while the pressure of spraying water cleaned them off. William Cochran was a rising star in the Democratic Party, but too much alcohol led to a violent temper and illness. While Cochrane was busy with the details of her invention, William went away for a rest. Unfortunately, he didn’t get well, and he died two weeks later in 1883. While the Cochrans appeared to be successful socialites to their friends, all was not well at home. Her husband left Cochrane with a mound of debt and only $1,535.59. Now, developing the dishwasher was not only for convenience, it was for survival. Her creation had wire compartments for plates, cups and saucers. They were put inside a wheel that lay flat inside a copper boiler. A motor turned the wheel pumping hot soapy water from the bottom of the boiler over the dishes. Cochrane showed her design to a few men for their input which ended up being a frustrating experience. “I couldn’t get men to do the things I wanted in my way until they had tried and failed in their own,” she said. “And that was costly for me. They knew I knew nothing, academically, about mechanics, and they insisted on having their own way with my invention until they convinced themselves my way was the better, no matter how I had arrived at it.” 2 Finally she got help with the construction from mechanic George Butters and received her first patent on the Garis-Cochran Dish-Washing Machine December 28, 1886. In 1893 Cochrane convinced restaurants at the World’s Columbian Exposition in Chicago to use her invention, and it was an exhibit in Machinery Hall. That success led to her opening her own factory in an abandoned schoolhouse. Her customers extended to hospitals and colleges for whom the sanitizing effects of the hot water rinse were important. Homemakers finally started using it, too. In 1912, at 73 years old, Cochran was still personally selling her machines. She died in 1913. In 1916, her company was bought out by Hobart which became KitchenAid and is now Whirlpool Corporation. Cochrane is considered the founder. QUESTION: Which modern convenience do you think it would be impossible to live without?